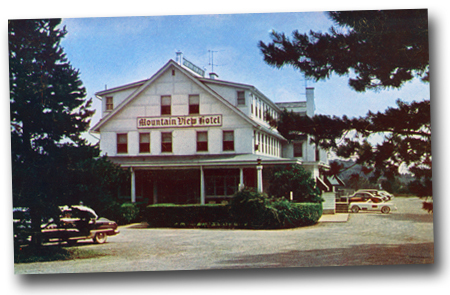 Lancaster Online posted their regular Flashback column, which often has news of the Lincoln Highway. This story from December 1934 explains how the highway was to be widened east of Lancaster through Soudersburg. It’s interesting to see that this always-crowded stretch was already straining under its traffic 75 years ago. State and local officials announced that an eight-mile-long project to widen the Lincoln Highway, from the east end of Lancaster City to Leaman Place, was beginning in a few weeks. Plans called for a four-lane highway from the city to Mellinger’s Church, and a three-lane road from the church to Leaman Place. The project was made possible by the decision to abandon trolley service from Broad and East King streets to Leaman Place. 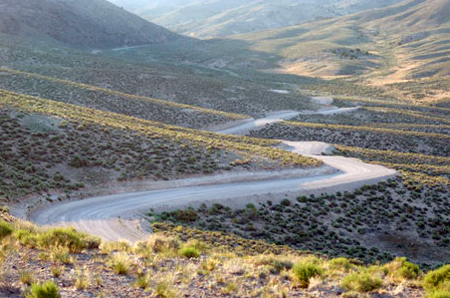 That move made available the land needed to widen the road, which was considered one of the most dangerous stretches of highway in the area. Mike Buettner sent photos and a story by Mike McNaull (president of Mid-Ohio Chapter of the LHA) about a recent Lincoln Highway caravan. Read his story below. This trip originated in the Target parking lot at Mansfield/Ontario, just north of “new” US 30. Under the direction of the trip’s organizer, Mike Hocker, we headed west on the new road till we reached Bucyrus, and then turned south to intersect the old road. Along the way, we kept our eyes open, looking for answers to the “Shotgun Rider’s” trivia test (one assigned per vehicle). Following the 1913 route thru Nevada, Upper Sandusky (for a quick group photo at the brick section behind Willson’s Grocery), Kirby, Forest, Patterson, Dola, and then into Ada for a terrific meal at Viva Marie’s on the south side of town. While at Viva Marie’s, Mike Hocker collected the road trivia test results, and the winners were the vehicle of Richard & Mary Lou Taylor, and Phil & Marilyn Johnson. The restaurant had opened earlier-than-normal this day to accommodate our LHA group, and they treated us very well. Service was great, portions extremely generous, and the food very tasty (well worth the drive). We could have turned around and headed back home immediately after eating, calling it a day, but the best was yet to come! After dining, we again headed west on the old road, passing thru Beaverdam, Cairo, and then into Gomer, stopping at the Welsh Museum. We were pleased to hook up with Mike & Tammy Buettner. At this point, the group split, with some pressing on to Delphos, to the Canal Museum. They are in the midst of building a new stairwell, and their Christmas trees had just been set up. The tour guides we very enthusiastic, showing-off their latest acquisition: a genuine WWI American machine gun! Both museums are real treasures for their communities, capturing the bygone days with photos, displays, and artifacts that tell the story of a simpler time in America. It was very encouraging to see LHA displays at both museums, and it was especially good to see the scale-model Snow Cruiser at Gomer made by former Mid-Ohio member Ray Gottfried. This entire day was an ideal experience, and we all need to thank Mike Hocker for all of his efforts; from his very professional strip-map with six sections and itinerary, down to the “Shotgun Rider’s” quiz! This is a trip that we’ll be talking about for a long time to come! Row 1 – Nancy Hocker, Mary Lou Lockard, Mike Hocker, Mary Lou Taylor. Row 2 – Keith Lupton, Maureen Lupton, Hanni Talpas, Vivian Stitzel, Marilyn Johnson, Tom Lockard, Jean Stauffer, Harold Zager, Jane Zager, Mel Draper. Row 3 – Joe Everly, Nancy Everly, Richard Taylor, Phil Johnson, Mike McNaull. 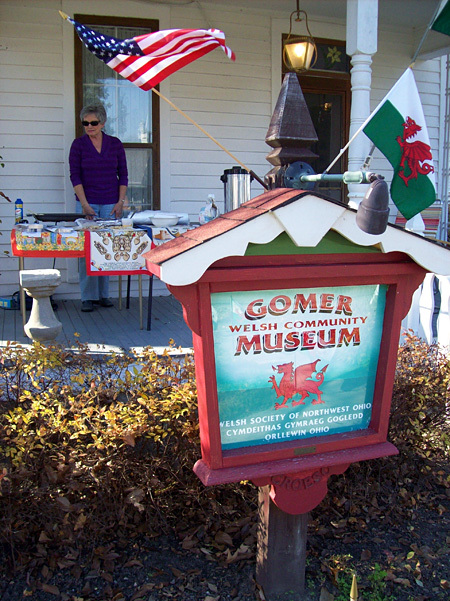 LHA Member Carla Olds was one of the hosts at the Welsh Community Museum in Gomer, and was waiting for our arrival on the front porch of the museum with some beverages and traditional Welsh cakes. Prominently displayed inside is Ray Gottfried’s scale model of Admiral Byrd’s Snow Cruiser, which famously crashed just east of town in 1939. This new mural was recently painted on the old Lincoln Highway Garage at the northeast corner of Fifth Street and Main Street in downtown Delphos. We gave the building owner a “CONTROL STATION” sign many years ago, which remains on the corner of the building. 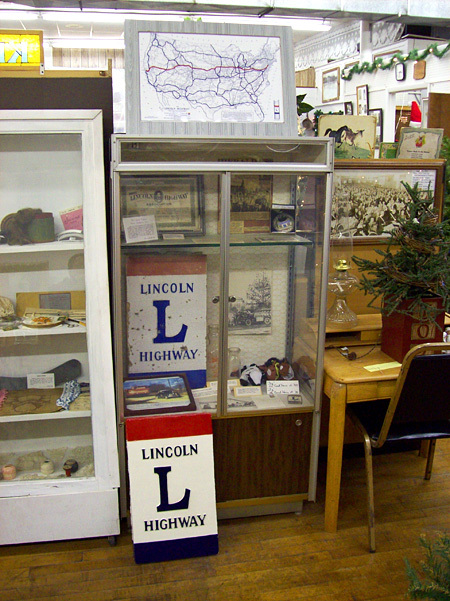 The Delphos Canal Commission Museum has this modest, but significant, Lincoln Highway display. The old terra cotta sign in the display case was salvaged from the original brick pillar in Oceola after it was destroyed by a wayward vehicle in 1993, and later purchased at a sale by a Delphos collector. The old sign was used as a model for new signs (such as the one on the floor) that have been placed in several brick pillar replicas in Ohio. The G.C Murphy Company was once one of the titans of the 5 & 10 trade. Not as well known as Woolworth’s or a competitor that followed, K-Mart, it nonetheless boasted more than 500 stores in the eastern U.S. One of them was along the Lincoln Highway / Penn Ave. in Wilkinsburg, Pa., and though it closed long ago, the letters remained on the facade until last week. The store was one of two in the relatively small town; this was likely one of the last G.C. Murphy Co. signs to remain intact in its original location. Targeted by corporate raiders in 1985, the G.C. 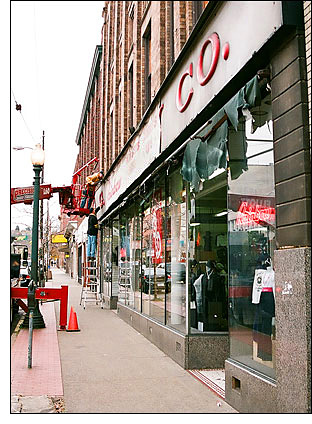 Murphy Co. was taken over by Connecticut-based Ames Department Stores, which closed more than 100 of its variety stores … but the Wilkinsburg store — the 39th in the chain — was spared. In 1989, the Wilkinsburg store and 130 others were sold by Ames to McCrory Stores Corp., which went into permanent decline in the 1990s and finally closed all of its remaining locations in 2002…. The Wilkinsburg store is now part of Brooklyn, N.Y., based Rainbow Shops Inc., a low-priced clothing chain for women and children. Two sign companies donated the battered letters to the G.C. Murphy Co. Foundation, which hopes to restore and preverve them. Just a quick note to explain the lack of recent updates. Among the many difficult times here lately was the death of a close friend and an out-of-town funeral. Here’s hoping we all get to spend a little more time with those we love on the road of life. Lincoln Highway photo by Rick Sebak. Scott Berka (city clerk of Colo, Iowa) wrote to say Niland’s Cafe at the Reed/Niland Corner in Colo, Iowa, will host a man walking the Jefferson Highway from Winnipeg to New Orleans. The Colo Development Group invites all to attend on Monday, November 9, at 9:00 a.m. 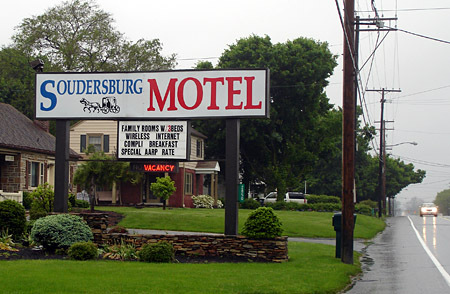 The one-stop gathering of classic roadside businesses is at the intersection of the E–W Lincoln Highway and the N–S Jefferson. ABOVE: Standing on the Lincoln Highway and “above” the Jefferson Highway at Reed/Niland Corner. BELOW, Berka at the cafe counter. The Winnipeg Free Press reports that Mike Conlin from New Orleans and Gary Augustine from Prince George, B.C., have already departed Winnipeg, the northern terminus of the Jefferson Highway. “People are right into this stuff and, with the baby boomers all ready to retire, and into that age where you’re more into history, I’ve got a feeling that that highway is going to come back,” said Conlin. The Jefferson Highway, established in 1919, was the first north-south transcontinental road to span the North American continent, named for the third U.S. president of the United States. It runs through Minnesota, Iowa, Missouri, Kansas, Oklahoma, Arkansas, and Texas, ending in New Orleans, Louisiana. 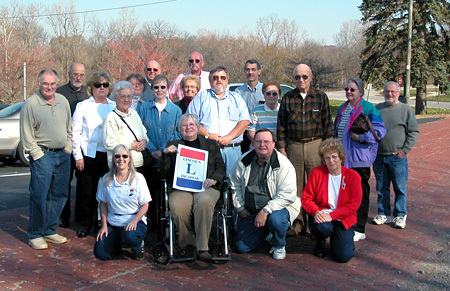 The Shopper Online reported on the dedication of two new highway plaques honoring the Lincoln Highway’s Ideal Section between Dyer and Schererville, Indiana. Ideal Section authority Art Schweitzer says the section was “a test highway to lay groundwork for future highway construction.” Engineering of its lighting, underground wiring, expansion strips, and 10”of concrete pavement was quite advanced in its day and was to serve as a model experiment. Speaking at Dyer was Steve Cramer, v-p of Dyer town council. Town manager Joe Neeb was unable to attend but is credited with much of the work involved in getting the approval for the plaques. The speech for Schererville marker (in the Hometown Inn parking lot) was presented by town manager Bob Volkmann. A ceremony was recently held in Rochelle, Illinois, to celebrate a new Lincoln Highway gazebo at the Rochelle Railroad Park off of Ninth Street. The gazebo is one of 16 along the Lincoln Highway in Illinois between Fulton in the west and Park Forest in the east. Stories appeared here and here. For more information on the Lincoln Highway through Illinois, including places to see, things to do, and stories of the highway’s significance and history, visit www.drivelincolnhighway.com/.